I do miss baking and cooking every day. We’ve made a few recipes, but we are slowly making our way back into the kitchen. 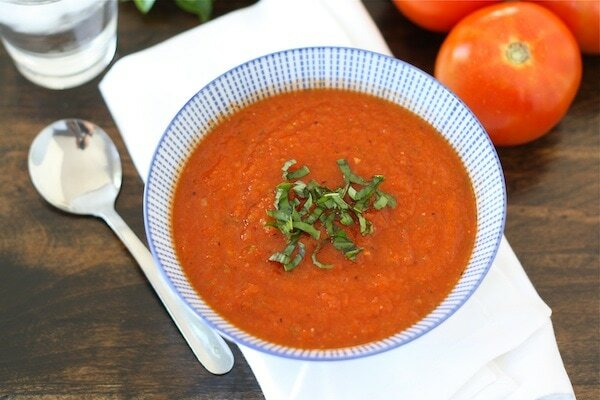 Before we had the baby, we made this Roasted Tomato Basil Soup. We put it in the freezer so we could enjoy a tasty meal without doing any work. I am so glad we planned ahead because this soup really hit the spot last night. Note-be careful when transferring the soup to a blender or food processor. You may want to wait until it is at room temperature to blend. Delicious! This soup looks perfect and, as you say, perfect for a busy evening! Tomato soup is my favorite kinda soup. I even like it out of a can. Any type of tomato soup, I’ll eat it. Never had it with roasted tomatoes. Sounds amazing!! I’ll have to try that soon. And I’ll remember to put some in the freezer as well. I’m in need of a good soup recipe! Tomato soup and grilled cheese is our go-to dinner for a busy night or when we can’t think of anything for that night…and it’s always a hit with everyone. Total comfort food. 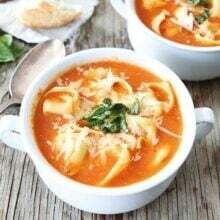 This soup looks wonderful and I love the texture and the addition of basil and garlic. I just made a tom basil soup and it’s divine… love that you roasted the tom beforehand… it prob adds a nice level of smokiness! Delicious! I love tomato soup, and with grilled cheese it’s even better! I could use a bowl of this right now…it’s raining out and this is a bowl of pure comfort. Looks so good! I have a Blendtec (based on your rec and I love it!) would you recommend the “soup” button or would it puree it to thin? Glad you love your Blendtec. You can use the soup button. Just puree it to the consistency you like. I like to leave a few chunks for texture, but if you prefer a smooth soup, puree it to thin. Enjoy! Isn’t it amazing how much Baby can change your life? We used to be organized and scheduled – Baby has other ideas. If it was anyone or anything else you’d be annoyed/upset that your life is being disrupted. But for that little one, who looks up and smiles (smiling yet?) you’d do anything for them. Enjoy him! Your baby is beautiful! Congrats on becoming parents 🙂 This soup sound delicious and a perfect use of my late season bounty of tomatoes, too. Question: Do you peel the tomatoes or just puree them and the skins into the soup? It looks wonderful! I didn’t peel the tomatoes, just puree the skins! 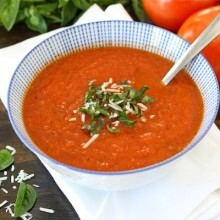 mmmm Roasted Tomato Basil Soup is one of my favorites! We make Pepperoni and grilled cheese sandwiches with ours. Yum! I would love a big bowl of this today! This is such a classic and always so welcome at the end of a long, tiring day. Glad to hear that the “little pea” is doing great and you’re all adjusting! I am a new reader to your blog and totally loving it! You’ve got great recipes, great writing and a very very cute little babe. I have been wanting to try a soup like this. 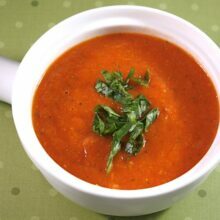 Tomato basil is my favorite soup of all time and I always thought roasting the tomatoes would be delicious. Thanks for the recipe! Mama needs an immersion blender. This sounds so great right now! Beautiful! Can never go wrong with tomato soup and grilled cheese! i love roasting veggies. this sounds amazing!! I. Love. This. Soup. So. Much. Go-with-the-flow is definitely the name of the game once you become a parent! Good thing you had this in the freezer…looks delicious! Mmm….grilled cheese and roasted tomato soup sounds like an amazing dinner! mmm , this looks so wholesome and delicious! That soup looks yummy Maria 🙂 And kudos to you guys for meal-planning, ahead of time! Tomato soup and grilled cheese = perfect combo! Yum! My favorite fall soup! Goes excellent with a grilled cheese sandwich!! Your little pea is precious! 😉 This soup looks delicious, will have to make double so we can freeze! I am a new big fan of your blog. I have tried a handful of things so far, and have yet to be disappointed. In fact, everything has been a whopping success! This soup was no exception. We loved loved loved it. I’m going to have to think twice before ordering tomato basil soup at restaurants from now on, because I don’t know how it could have gotten any better. We ate it with the pumpkin cornbread recipe we found on this website (which is my husband’s new favorite food, period). I’m looking forward to freezing the left overs of this meal and eating it again on the next cold and rainy day. Thanks for posting, even though life with a new baby is anything but predictable!! I wish I’d had a bowl of this soup for lunch today – it was cold and rainy here so it would have been perfect! I just made this soup this evening with a round grilled cheese sandwich that I plan to post tomorrow on my blog. I guess it’s just that time of year. With it freezing cold and raining here today hot soup and sandwich hits the spot. 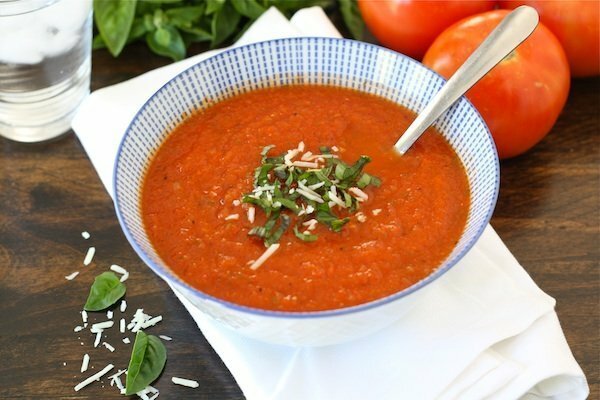 Your tomato basil soup looks wonderful! Very cool that you made and froze this before your little cutie arrived 🙂 It looks super flavorful! This is great for this cold season. Thanks for sharing your recipe. Caleb looks adorable by the way. I recently made a soup almost exactly like this and the one ingredient I wished I had on hand was fresh basil 🙂 Next time, for sure! I agree, roasting the tomatoes is totally key! Roasting the tomatoes makes ALL the difference, doesn’t it? My favorite way to enjoy tomato soup…. 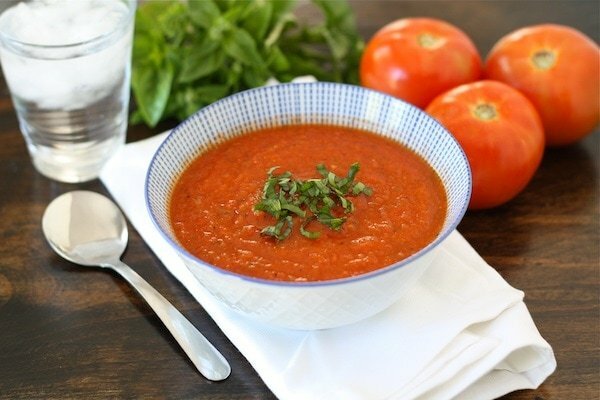 I love roasted tomato soup…especially in the middle of winter! Tomato Soup is one of my favorites!! This sounds perfect for Fall. I just roasted a bunch of tomatoes from my garden today, I love roasted tomato soup! Oh the soup looks fabulous. I need to make this TODAY! It’s cold, damp and foggy out. Perfect comfort food – SOUP! 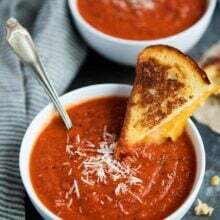 I have several reasons for trying this recipe…I adore tomato soup, I just bought The Hubby and I new soup bowls I want to use and last but not least I never use my immersion blender and I really should! There’s just nothing quite like a warm bowl of tomato soup and a grilled cheese. Yours looks perfectly textured and delicious. Brilliant idea freezing this before that little bundle of joy came into your world. It looks so vibrantly fresh, and pairing it with a grilled cheese sandwich sounds dreamy. I love tomato soup! Oh the days of organization and schedules! I miss those. The things I used to accomplish, LOL! I just made this for lunch and boy is it going down well! My picky 11 yr olds love it. Thankfully. I jazzed it up a notch by floating a gruyere laden crouton on top. Yum! you know I just love the smell of basil, freshly ripped/sliced to garnish into hot tomato soup. It just makes me feel so good. I’m going to print this recipe; I need to make this for winter. I hate winter but this might make me smile. I’ve come across a lot of people freezing soups this fall. I’m always freezing tomato sauce so I don’t know why I haven’t done it with soup as well. Such a good idea for a quick meal. I’m a big tomato soup fan and like how this one has something a little extra to make it unique. Beautiful soup Maria! I love tomato soup and there is something about it that makes it so comforting. I hope you are enjoying your little guy! Oh my goodness – I just made this and it tastes truly amazing! I never in my life thought I could make a soup that tastes this good. Thank you so much for sharing your recipe. Can’t wait to try this recipe this weekend, looks great! YUM! We love tomato soup and I have a feeling this one will become our new favorite. Your soup, and some grilled ham & cheese sandwiches are going to be Halloween dinner for my family. I’m planning to make it tonight while I have time, and reheat tomorrow for a quick dinner before all that trick or treating (3 kids; 7,9 & 12). Thanks for sharing this! Pingback: Tomato-Fennel Soup | Never Enough Thyme - Recipes and food photographs with a slight southern accent. Please post a warning on using a blender to blend the soup after it has cooled, blending it well hot caused the blender top to exploded off and splattter hot soup all over my face which caused 2 nd degree burns. I would have not used the blender if I knew that it was dangerous. I am so sorry you got burnt. P.s. I find adding 1 tbsp tomato puree after the garlic and a few mini bell peppers (red) with the tinned tomatoes adds extra depth to the flavour. Thank you so much for this recipe, I’ll definitely be using it again. I wonder if you could roast the onion and garlic with the tomatoes…any thoughts or experience with this option? i skimmed the 92 previous comments, so please forgive if this was already posted, but may i ask why the canned tomatoes? if you’ve already used fresh tomatoes, why add the canned? and may i substitute them with fresh? thank you! You can use all fresh tomatoes. I’ve only just discovered Two Peas and Their Pod, but I am hooked! The variety and creativity of your recipes are awesome! Anyway, made this soup last night and it was a big hit. One question…Do you seed your tomatoes? I didn’t and didn’t enjoy the texture of the seeds in what was otherwise a pretty smooth soup. However, I also couldn’t find Romas, so maybe that was the problem? This soup is delicious. I made it for a fall gathering and everyone was raving. Thanks! Just tried this the other night and LOVED it. 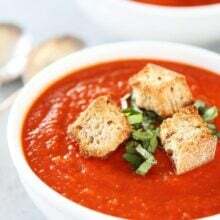 I’m not a big fan of tomatoes but I have always loved tomato soup, so I was worried that I wouldn’t like the consistency. It tasted great though! I will definitely be making this again in the future, and maybe even making some in advance so I can freeze it. Thanks for the great recipe! I am a newbie cook and have never made soup before. I just tried your recipe and it turned out great! It was super easy and tastes awesome. Thanks for posting! This soup was so easy and delicious! It will be my keeper tomato soup recipe! Do you have to use Roma tomatoes or would another variety work? I would like to subscribe to your list and receive your recipes by email. How do I do that? I do not do those other things you list. The soup looks great. I am a big fan of Tomato soup, infact thats the only one i take. This variation is new to me and will try soon. if i don’t have time to roast the tomatoes what can i do instead of that? add an extra can of diced tomatoes? or two more? thanks in advance for reply. Have made this soup a couple of times now as per the recipe with the exception that I roast the onions and garlic with the tomatoes in the oven and it’s amazing! Thank You!! Making it tonight though and thought I had a can of diced tomatoes and don’t. Making it without but wondering what it adds to the soup….With all the tomatoes in it already what does the can add? Delicious soup! I just made it last night without deviating from the recipe. Great for lunch at work today. However, it has a bit of a spicy kick for me so the next time I make it, I will omit the red pepper flakes. You’re my favorite cooks. Love you guys…. Is it necessary to use roasted tomatoes? This looks so yummy, I can’t wait to try it! 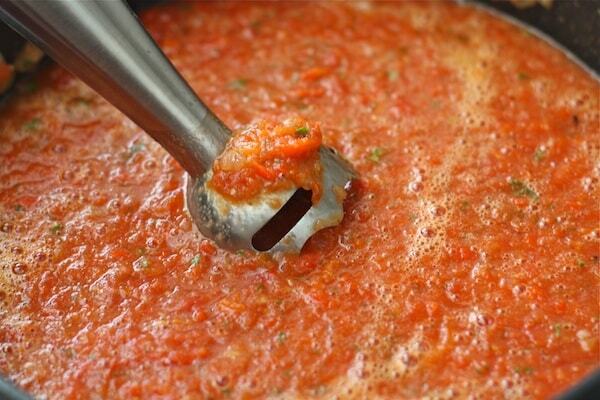 A question – why do you use canned diced tomatoes instead of just using extra fresh tomatoes? Thanks! This was absolutely delicious. It was a bit runny (and I used 3 pounds of tomatoes!). So next time I may drain the canned tomatoes and/or use less broth. I love this soup! So easy to make and it’s delicious. This year I made it with tomatoes and basil I grew myself…tastes even better for some reason! Making my second batch today to freeze and enjoy during the winter. We love it too:) Thanks for letting us know! What a great soup! I made it as directed although I didn’t have Roma tomatoes I had vine ripened tomatoes and they seem to work very well. I was a little heavy handed on the red pepper flakes which made it really spicy but still absolutel delicious.